The coloured leaf zonal pelargonium"Hilda Lea" is one of my favourites,and I look forward to her flowering every year. Raised by Ken Lea, UK. 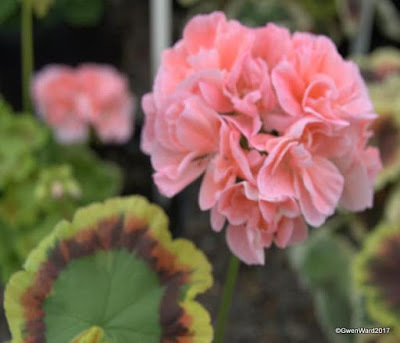 The double salmon coloured flowers above the gold tri-coloured leaves, make this a most attractive plant for any pelargonium collection. Which leads me nicely to the recent shopping trip I made to Sweden to stay with my friend Anne. Anne had very kindly invited both me and Liga to stay and to visit with her the well known Sune Trygg nursery. After picking us up from the airport, Anne took on us a trip to two garden centres and a wonderful nursery with an orchid exhibition. On the Saturday we set off for our planned trip to Sune Trygg, picking up Gunilla on the way. Sune Trygg had opened their nursery just for the day to members of the local pelargonium clubs. Here are a few pictures I took at the nursery. Thank you Anne for a wonderful visit. You had a good time and were in the places you were interested in. Regards.